Helping Businesses Ship Smarter In The Global Marketplace. 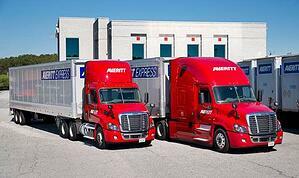 Ship to any point in North America with Averitt's cross-border freight services. Our North America transportation services cover all major markets in the U.S., Canada and Mexico. From time-sensitive shipments to complex distribution, we can help you achieve your goals on both sides of the border. Averitt’s LTL Pricing Portal is an online transportation management solution (TMS) designed for shippers and forwarders that would like to control their shipping needs directly with Averitt. Through the portal, shippers can shop for LTL rates with Averitt and book and track the shipments directly through the online portal. Because of Averitt’s technology integrations, you can enjoy access to the online TMS at no cost to you. For access to the portal, contact the Averitt International Solutions Team at international@averittexpress.com. No Matter Where Your Business Is Going, We've Got You Covered. For more than 45 years, Averitt has partnered with shippers of all industries to achieve their supply chain goals. Our approach offers a customer-centric experience that looks at your specific needs and challenges. We know that your international supply cain is not the same as everyone else's, and that's why we'll look for the best solution based on transit times and costs. The Averitt International team provides 24/7 customer support and monitors shipments around the clock. Our bilingual associates can also help bridge the communication gaps that can arise with international logistics. More importantly, Averitt has the resources and services that can allow you to streamline your supply chain structure. We can develop complete origin-to-destination plans that will help you simplify your practices. We'll enable you to focus less on your international logistics so you can focus on growing your business! ARE YOU READY TO START SHIPPING OR LEARN MORE? The Averitt International Team is ready to help you with your shipping needs. If you would like to learn more about our international forwarding and supply chain services, or would like to request a rate quote, please fill out the form. Additionally, we're available 24/7 to answer your questions. Contact us by phone at (866) 208-0167 or by email at international@averittexpress.com.